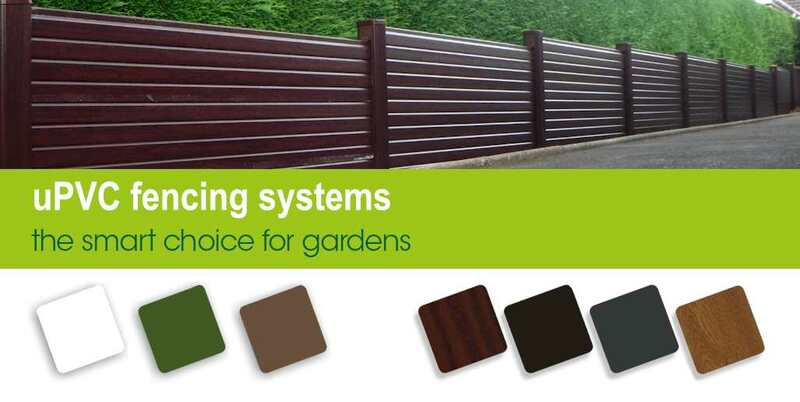 For years our fencing range has been providing an attractive, low maintenance alternative to more traditional fencing products – and the latest enhancement has made them an even more alluring option. Now available in a range of woodgrain effect posts and gravel boards. These panels deliver the natural appearance of timber while being completely maintenance free and guaranteed for a minimum of 10 years. The woodgrain effect fencing is beautifully foiled and available across the full range of gravel boards, post caps and utility strips and is available in Golden Oak, Rosewood, Black and Anthracite Grey. Description: Brown In-line Posts Sizes available: Available in 8ft lengths (posts have metal inse.. Description: Plastic gravels boards are 6 foot wide and available in green brown white or beige. ..
Made from lead-free window grade durable PVCuOur range of PVCu fencing can be installed in exactly t.. Description: Green In-line Posts Sizes available: 8 foot lengths With metal inserts Colour: Gr.. Description: White In-line Posts Sizes available: Available 8ft ( posts have metal inserts).. The new range of woodgrain effect posts and gravel boards delivers the natural appearance of timber ..
Anthracite Grey Woodgrain Effect PVC Fence / Gravel Board 6' X 12"
Woodgrain Effect PVC Fence / Gravel Board 6' X 12"The new range of woodgrain effect posts and gravel..
Rosewood Woodgrain Effect PVC Fence / Gravel Board 6' X 12"
The new range of wood grain effect posts and gravel boards delivers the natural appearance of timber..
Golden Oak Woodgrain Effect PVC Fence / Gravel Board 6' X 12"
Description: Convex Max 300mm High Decorative Gravel Boards. Sizes available: 300mm High Colou.. Description: A Utility Strip may be used to cover the slot of an end fence post to give a smooth fin.. Description: Concave Min 150mm High Decorative Gravel Boards. Sizes available: 300mm High Colo.. Description: Gothic Decorative Post Cap - (Fixes to a flat cap supplied) Sizes available: To fit .. Description: Ball Decorative Post Cap - (Fixes to a flat cap supplied) Sizes available: To fit In.. Description: Acorn Decorative Post Cap - (Fixes to a flat cap supplied) Sizes available: To fit I..
Woodgrain Effect PVC Fence Convexed PanelThe new range of woodgrain effect posts and gravel boards d..
Woodgrain Effect PVC Fence Concaved PanelThe new range of woodgrain effect posts and gravel boa.. Description: Clips easily to the top of a standard Liniar post or corner post, in place of a post ca..